• Puree the dressing, cucumber, horseradish, milk, vinegar, wasabi powder, cayenne pepper, and salt to taste in blender until smooth. • Cover and refrigerate until ready to serve. • Bring the broth to a boiling a saucepan over high heat. • Add the green beans and cook until tender, about 5 minutes. • Remove the beans and rinse with cold water. • Whisk the egg and milk in a shallow bowl. • Put 1/2 cup instant flour in a second shallow bowl. • Combine breadcrumbs, the remaining 1/2 cup flour, the onion powder, garlic powder, cayenne and salt and pepper in the third shallow bowl. 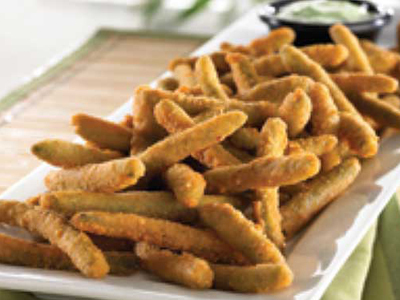 • Toss the green beans in the flour and shake of excess. • One at a time, dip the beans in the egg mixture, dredge in the breadcrumb mixture and lay on the prepared baking sheet. • Freeze until the coating is set, about 30 minutes. • Heat 1 inch oil in a deep pot over medium heat until a deep-fry thermometer registers 350 degrees F.
• Fry green beans in batches for 2 minutes until golden brown. • Transfer the beans with tongs or a skimmer to a rack or paper towels to drain. It seems like the only thing I ever order in Starbucks is Chai Tea Latte. And since sometimes I don’t feel like going anywhere I learned how to make Chai Tea Latte at home.